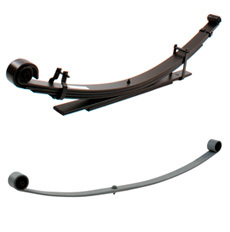 There are two types of leaf spring used for vehicles; the multi leaf and the parabolic leaf spring. The multi leaf spring design is based on the use of a flat trapezoid geometry, with cut leaves stacked one on top of the other. This leads to a multi leaf design with different lengths of each leaf. When a multi leaf spring deflects the leaves move relative each other. The contact between the leaves produces a friction between them, which leads to a difference in load between compression and decompression. The longest leaf has two eyes for assembling to the vehicle body. The strength of this leaf and the eyes are critical and sometimes the second leaf will have safety loops which hook around the main eye as a back up in case of failure. The centre of the spring is normally fixed to the vehicle axle with U-bolts. The parabolic spring is designed for low internal friction and lowest possible weight and consequently has fewer leaves. The leaves are partly given a parabolic shape from the centre to the end of the leaf, which gives an equal bending stress level along the parabolic part. This ensures efficient use of material and minimum weight. The shape of the leaves is such that contact between the leaves only exists at the centre and the ends. And since the centre of the leaf spring is fixed to the axle with U-bolts, the only friction comes from the end contacts. Rubber pads are also sometimes used to lower the friction. As with multi-leaf springs, the strength of the eyes is a critical safety factor.